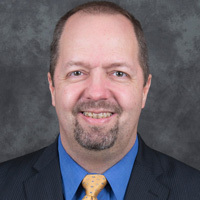 Julian Schuster, Webster University's provost, senior vice president and chief operating officer, has announced that Michael Cottam, associate vice president and director of the Online Learning Center, has been named dean and associate vice president of Military Campuses and Online Education, effective Sept. 1. In this role, Cottam will oversee military base locations in addition to the online operations. In his new role, Cottam will also work closely with the leadership of the metropolitan campuses, the deans of the schools and colleges, and the academic support units to further strengthen the experience of Webster students. Cottam joined Webster in July 2014 from Portmont College at Mount St. Mary’s, where he served as dean of instruction, creating a new online college. Cottam received his bachelor’s degree in Spanish, a master’s degree in Spanish Applied Linguistics, and a doctoral degree in Educational Technology, all from Arizona State University in Tempe, Arizona. The Office of Military Affairs (OMA) will continue to serve military and veteran students’ needs. Watch Webster Today for further announcements on the OMA.